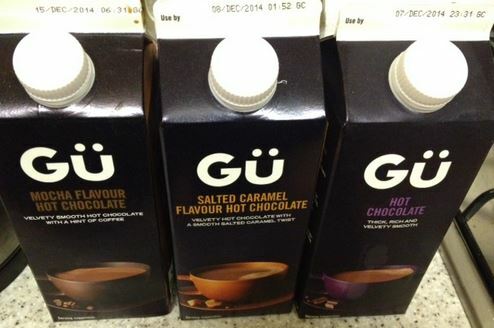 Is there anything more delicious than Gu? OK – my mom’s butter tarts but you’re not going to be buying them in your local Sainsburys any time soon. Or ever really. Not if I have any say in things 😉 Anyway, my mom’s butter tarts aside, is there anything more delicious than Gu? Of course not! Those chocolate pots… oh my goodness! I have a special tiny spoon to eat them with so I never take too big a spoonful and let it melt in my mouth 🙂 Heavenly bliss! Classic – I liked this one so much, I forgot to take a photo. I mean, it is a creamy chocolaty hot chocolate with that curl-your-hands-around-the-mug kind of feeling to it. 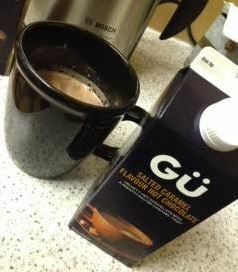 With the warmth of the warm milk expertly blended with chocolate it makes this hot chocolate one I am sure to buy again. If you are sure about flavours and whatnot, this is absolutely the one for you. It is rich deep and chocolaty and just the right consistency. It isn’t sickly sweet either which is important because while you could add sugar I suppose, you can’t take it away. Salted Caramel – while there was a scent of salted caramel it wasn’t too sweet nor was it too caramel flavoured. It was slightly lighter in chocolate flavour than the classic but I wasn’t as much of a fan. I think if you love salted caramel as a flavour you might go for this but as I had the plain one first that remains my firm favourite. There is the smell of the salted caramel on the nose it’s just not too overpowering on the palate. Mocha – This was husband’s favourite. A coffee lover he instantly claimed this carton in the name of himself and volunteered selflessly to try it. Isn’t he a darling? This did have a distinct coffee flavour and the taste was mild so not too overpowering. 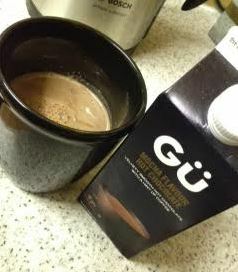 It was delightful to drink and for those of you who are both coffee and chocolate fan this is going to be brilliant. The coffee flavour adds a bit of something extra without again overpowering. There is much more of a coffee flavour to this than a salted caramel flavour in the other though so another winner.